The Caduceus emblem, two snakes wrapped around a winged staff, hails from Greek mythology and was adopted as a medical symbol by the United States Army in 1902. Since then, it has been proudly worn by medical officers. 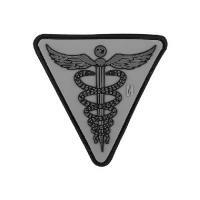 This morale patch from Maxpedition features a finely detailed Caduceus. Constructed from durable PVC rubber, it is tough enough for use on outdoor survival gear and equipment. The hook back attaches to any loop surface, such as the ones found on many of Maxperdition's bags. The patch also comes with an additional loop sheet that can be sewn onto clothing, or used to protect the hook-backing when the patch is not in use.